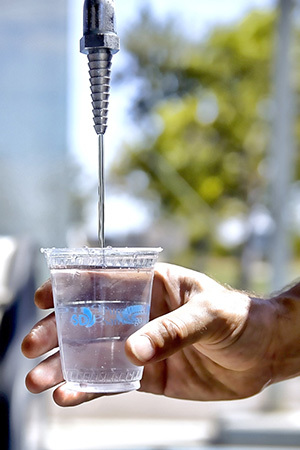 order now San Diego’s goal to provide one-third of its own water by 2035 took a major step recently when the City Council approved a low interest loan that will finance nearly half of the first phase of the Pure Water program. buy now The $614 million loan comes from the EPA’s Water Infrastructure Finance and Innovation Act (WIFIA) and will cover 49 percent of the $1.25 billion project. cheap generic viagra mail order pharmacy The WIFIA program was created to accelerate investment in the nation’s water infrastructure by providing long-term, low-cost supplemental loans for regionally and nationally significant projects. The Pure Water program will offer a cost-effective investment for San Diego’s water needs and will provide a reliable, sustainable water supply. Pure Water will eventually recycle up to 83 million gallons of water daily once the project is completely finished. The first phase of Pure Water is scheduled to begin construction in 2019 and open in 2021. It will expand the city’s potable water production capacity by 30 million gallons per day to replace the use of imported water. The project will require construction of new facilities, pump stations, and pipelines along with upgrades to current facilities. This important project will provide the San Diego region with a clean, safe, and sustainable water source for generations. For more information on the Pure Water program, please visit purewatersd.org. —San Diego City Councilmember Scott Sherman represents the District 7 neighborhoods of Mission Valley, Grantville, Allied Gardens, Del Cerro and San Carlos.